Ateneo De Manila University alumnus, Magnus Historae recently commented about an exchange that happened between journalist Raissa Robles and lawyer Edwin Lacierda. 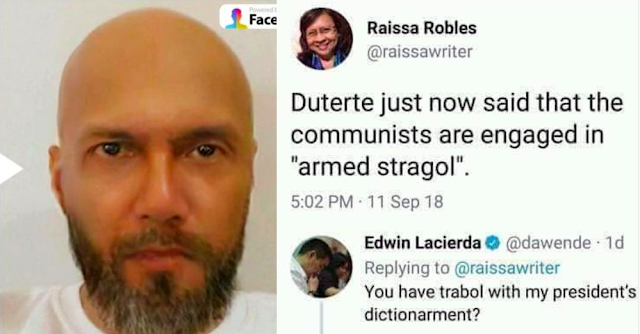 Robles said, “Duterte just now said that the communists are engaged in ‘armed stragol’”. 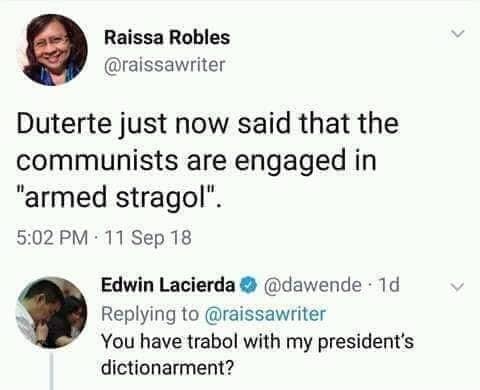 Historae, along with other netizens took it as the two mocking President Rodrigo Duterte’s English. He went on to attack the two, saying, “So, what do you mean Robles and Lacierda, that you are now superior than most of us because your impeccable knowledge of the English language”. Historae took offense, saying that there are other nationalities like the French and Germans that have heavy accents as well and do not know how to speak English well, but they are not mocked, because it is understood that English could just simply be their second language. He then goes on to say that these comments from Raissa and Lacierda are clear indication that they are “ill-mannered and rude”. But Historae is not surprised, he says, because this behavior he says is expected from the “Yellows”. He adds that it is very discriminatory, especially to those who live in the provinces of Visayas and Mindanao who sometimes have thicker accents than that of the president. “So, what do you mean Robles and Lacierda, that you are now superior than most of us because your impeccable knowledge of the English language? Okay, so how about the French and the Germans, the Italians and the Russians, or the Spaniards and Portuguese? They are heavily accented too when they speak English, if they know English at all. Does it mean to say that you’ll also make fun of them? Are they now lower that the two of you simply because they cannot pronounce English words as perfectly as the two of you? You two are ill-mannered, and rude. But that is the common lot of you people out there. 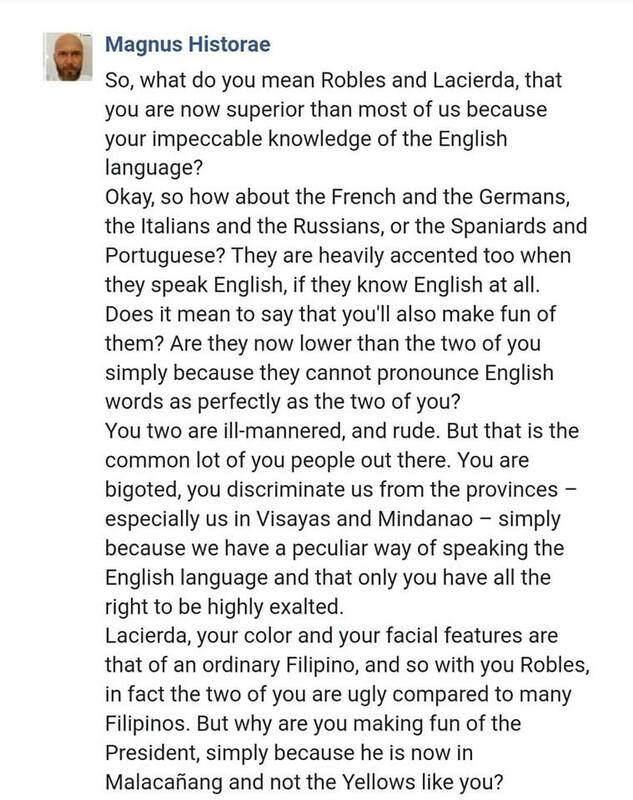 Your are bigoted, you discriminate us from the provinces - especially us in Visayas and Mindanao - simply because we have a peculiar way of speaking the English language and that only you have all the right to be highly exalted. Lacierda, your color and your facial features are that of an ordinary Filipino, and so with you Robles, in fact the two of you are ugly compared to many Filipinos. But why are you making fun of the President, simple because he is now in Malacañang and not the Yellows like you?"